[C]aR – 1. Conclusion: What We Fail to Contemplate Contemplates Us – pt. 1 | What is Manga? 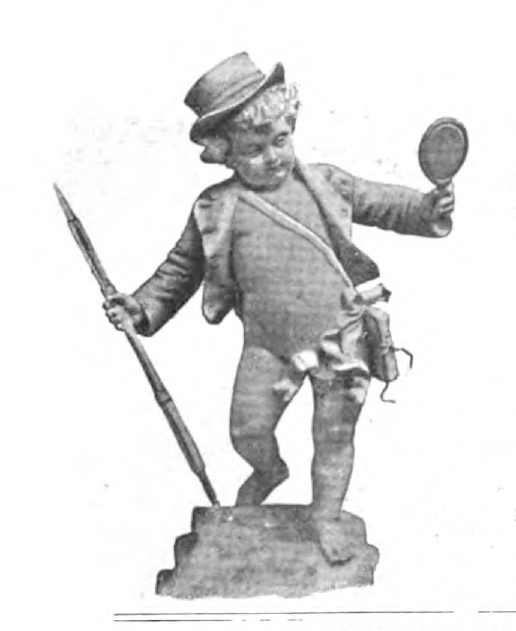 The Katzenjammer Kids was an immense and immediate success, but historians of the epoch claim to have established with certainty that the reading matter most in demand among wounded doughboys on the Western Front in 1917 and 1918 were the then current versions of the [Sears Roebuck Catalogue]. I cannot remember precisely when it was, but I recall clearly a minor incident with my then three year old child. She had found a folding compact mirror lying on the coffee table, brought it over to me where I was sitting before my computer, and asked, “Daddy, could you read this for me?” At the time, I could not quite see what she had in her hands but assumed she was holding a book—this is a common occurrence; I’m trying to work on something important but am compelled by a small person to read a pile of books that she has meticulously laid out on the couch—so I finish my sentence and turn to see what she has brought me. I am taken aback. My first impulse is to correct her usage, to point out how one does not “read” a mirror, but for whatever reason I hold back. Three years of reading to someone slowly but steadily acquiring a shared language has taught me not to take my presumptions for granted and to recognize how my learned, elder, “correct” sense of things is quite often simply a conceptual blindness. For there are perfectly acceptable formal reasons for why one might “read” a mirror of this kind, reasons that point to a common feature of books that most of us simply take for granted, that a codex, due to the nature of its binding, is, like a compact, hinged on one side, so it is physically manipulated in a similar manner, even though conceptually we learnèd adults think of a book and a diptych mirror as wholly distinct, like apples and oranges, as the saying goes. Yet, both are the edible fruit of similarly arboreal plants, even if one is a tree and the other a shrub. As analytical bibliographers, book historians, and fellow travelers can tell you, the hinge-i-ness of a codex is actually an important feature, when compared with that other common ancient book form, the scroll, because it allowed for rapid movement between parts of the book and for keeping certain pages open with the finger for the purposes of comparison (consider, for instance, the all too common practice of holding your finger in a page while checking an endnote). It has been suggested that this feature of the codex even helped facilitate that very common interpretive practice of the Middle Ages, prefiguration, whereby events of the Tanakh/Old Testament are viewed as allegorical precursors to events in the life of Jesus. We now by and large overlook the hinge-i-ness of the codex (as well as the rapidity of “flipping through”), because it has almost entirely supplanted other book forms. Moreover, my daughter’s “error” is not a mere lexical accident, choosing any ole word for a lack of knowing the proper idiom. She knows full well how to say “show me this” or “can we look at this” or “let’s play with this” and how to apply them generically when she is at a loss for words. No, she chose “read” quite explicitly, I imagine, because reading is near and dear to her, as it is to her mother and father. She is, quite literally, surrounded by books, be they the books that cover the mantelpieces upstairs and down, the overstuffed shelves in every room, the books (both hers and ours) littered all over the floor, the books surrounding the television threatening to exact a terrible revenge upon it, the books on the tank of the toilet, on the nightstand, on the kitchen table, on her bed, all over my desk, etc. She has been read to every day since she could hold her head up straight, and she is fond of imitating the act of reading, much to my embarrassment (do I really sound like that?! ), even while, properly speaking, being completely unable to understand the written words. She is regularly getting into books she should not be touching, which she stealthily squirrels away beneath her bed. It is not exactly a stretch for her to see something unfamiliar that operates in some ways like a book and assume that you read it. She has the habit of casually narrating her behavior, as if it were the writing in one of her many books, with complete indifference, much to Lacan’s chagrin, to the theoretical provocations of mirrors. You likely care very little about my daughter, but her behavior is meant to draw back from the fairyland of theoretical speculation several principles that will underlie the various reading excursions in this book: 1) the importance of proximity between seemingly different forms in making categorical distinctions between them as well as their relationship to each other (in terms of influence, for instance), 2) the role of life/historical experience in the ongoing re-vision of formal categories, 3) acquiescence and resistance to the participation of other texts and persons in normalizing the discourse of a particular cultural artifact, 4) how tangibility interferes with and complicates otherwise tidy formal abstractions, 5) and how comics especially, though not exclusively, poach other visual forms as a means of constituting what they are, if only provisionally. This is by no means an exhaustive list but is rather meant to present some of the challenges faced when beginning from reading practices, in particular practices that mesh poorly with our working assumptions about the world, rather than from the conceptual, pseudo-Platonic treatments of textuality that are nowadays de rigueur and have been for some time. Furthermore, it is unnecessarily self-defeating to leave categorical determinations to the sequestration of theoretical speculation, as if it were purely the domain of the specialist among specialists, whose scholarly activities are only barely tolerated by those who regularly profess to be interested in the very same thing, this question we sometimes call [comics]. For the question of categorical determination is a mundane one as well, a practical necessity visible in many environments for books and bookish things, nearly all of which go unexamined by a nebbish class invested in asking slightly different questions in all the same ways. I apologize for the rough language, but I should note that I am just such a neb, as wont to rely on my own easy orthodoxies as anyone else, so what I say here is as much therapy for myself as a Jeremiad against the sins of my fellow travelers. Left unexamined, we risk missing how [comics] are learned as a form, how we and our progeny learn to make meaningful but arbitrary distinctions among the constituents of a vast textual landscape wherein formal properties matter only as much as—and often far less than—the discourses that attend to texts or cultural artifacts more generally. The only definition of comics I have ever encountered that continues to occupy my thoughts long after I have forgotten everything else in the book is Martin Barker’s. Note, though there might be certain superficial similarities, that Barker does not quite say the same thing as Beaty in Comics versus Art. The important difference lies in Barker’s coy use of the passive voice. Whereas Beaty would attempt to identify the human agents whose determining power has influence over the categorical determination of what is and is not a [comic]—or what in my parlance ought and ought not be read as [comic]—Barker writes of “public arguments” and the implicit rules of a certain critical game, whereby one abides by norms (re: “what is acceptable”) so as to say anything at all on the subject. I, however, would not limit myself to the framework of Barker’s “public arguments,” which still smacks of the kinds of conversations scholars and other similarly interested parties have among themselves. I would argue, rather, that there are participants in this “public argument” that are both far less theoretically oriented and potentially far more influential. It must be kept in mind that things do not exist meaningfully outside of a discourse attendant upon them–a symbolic order according to one brand of jargon–cultural artifacts in particular. Simply put, without a discourse of what a [comic] is there is no such thing as a [comic]. I believe Barker intends to say something to this effect, but he too is still reliant first on simple visual, formal properties for his definition, before he can even think to venture onto the point that a [comic] is determined as such in the ways it is talked about and reified in all the texts about [comics] we have accumulated over time. Though I suppose this latter point is somewhat less ground-breaking in a postmodern critical milieu, in our post-postmodern world, where we quite commonly revert back to the old easiness of simply disregarding theory, it is a thought worth thinking again. This reality of a [comic]’s being so only in discourse accounts quite tidily for the various historical transformations which [comics] have undergone and which continue to perplex anyone who settles down to say once and for all, “this is what a [comic] is.” This is also, then, no mere happenstance, the accident of critics bumbling about making arbitrary claims, but a poetic effect; artists and critics and nebs and fans and idiots can pro-actively intervene in a [comics] discourse, admittedly with varying degrees of efficacy, to create subtle shifts in how we think [comics], either by bloviating in the manner of your dear author or creating a text that upsets settled categorical determinations and which one insists upon being a [comic]. You might fail to convince—and that is a risk—but you also might succeed. Additionally, this means that the [comics] discourse is as varied as those who choose to participate in it. I recall well how, in a coffee chat with a search committee after one of my more triumphant job talks, I talked about my frustration with scholars in the [comic] studies field who overreach in treating basically any illustrated text as if it were a comic. One of the committee members “agreed” with me, adding, “of course they aren’t [comics]; they aren’t even funny!” Suffice it to say, I was taken aback, but it was a not-so-gentle reminder that conceptions of [comics] that scholars believe had been left in a ditch somewhere along the highway bleeding out are, much to our chagrin but also to our humility, alive and well. In case you were wondering, I did not get that job.